Unfortunately, there have now been two instances during the course of this school year where there have been significant national tragedies on a large scale–the Sandy Hook shootings and now yesterday’s bombings at the Boston Marathon. Having to come to terms with such events is challenging for everyone as we struggle to make sense of the completely nonsensical. The act of music-making is inherently fun. Joyous. Enjoyable. There is a reason that musicians say that we “play” our instruments instead of saying that we “work” them–even though it is work, that work is more fun than not. 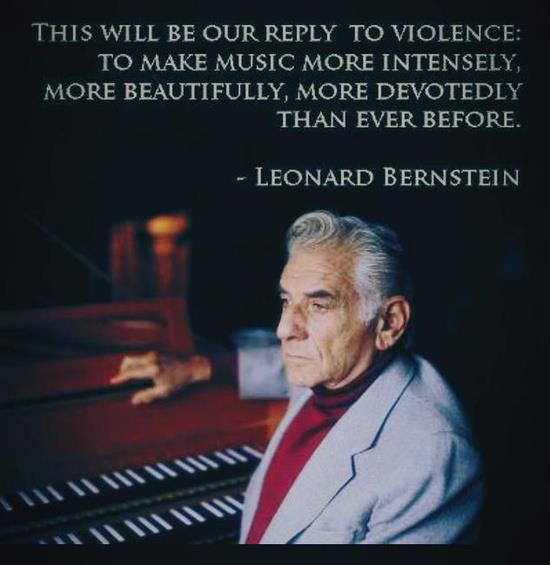 At first, the act of music-making seems completely incongruous with the emotions of grief, anger, and sadness that affect us all to some degree or another when we experience these kinds of tragedies. There is a palatable moment of awkwardness in the music classroom on the day after a tragedy when we are about to make our first sounds. Everyone is thinking some version of the same thought: is it really appropriate to play music under the circumstances? Especially music that is not grieving, angry or sad to match the emotions of the day? The answer is difficult, but is a resounding “yes.” Playing music is a deeply personal opportunity for every student to express themselves however they choose. If the music is happy, but I’m in an angry mood, I can play that happy music in a way that channels the angry mood I’m experiencing. If the music is upbeat, but I’m feeling sad, I can play that upbeat music in a way that channels the sadness I feel. More importantly, if three students are sitting next to one another, and one is happy, one is angry and one is sad, they can all simultaneously express those emotions through any given music and not have those simultaneous emotions conflict with one another. When the emotion of the music matches the collective emotion of the musicians playing it, the effect is overwhelmingly powerful. Talk of feelings and self-expression runs the risk of playing to a stereotype of arts education that I want to avoid. Learning about and experiencing the arts is not (or does not have to be) primarily about intangible qualities of developing an appreciation for beauty, “aesthetics” (nobody really agrees as to what this word actually means in our field–but it sure sounds important doesn’t it?) or helping with self-expression. Arts education has plenty of measurable benefits in addition to these immeasurable benefits. Yet, self-expression is very important and developing healthy forms of self-expression for students is vitally important. Today in class, before we play music and in that moment of palatable awkwardness where students will wonder whether or not it is appropriate to play music in light of tragic events, they will be reminded that their music class may be the one class they attend today where the subject of the class allows every single student to express whatever feelings they have about yesterday’s events, and where they will express those feelings simultaneously with their classmates. Most importantly, this simultaneous expression of potentially conflicted and contrasting feelings will not result in the chaos that it would in any other context, but will instead result in something pleasing and rewarding–musical sounds. Literally, through the music they play, students will be rewarded for expressing themselves in a healthy and productive way by how they choose to play it. As a conductor, it is my job to make suggestions and give guidance to young musicians as to how they should play particular bits of music–but when all is said and done, and especially on days like today, the choice of how to play is always theirs and theirs alone. It is on days like today more than any other that music’s value as part of every student’s school day should be evident.